What is optimum exposure and how does one know when it’s been achieved? It depends. A skilled photographer may want a photo to be really light or dark, or to have either extreme contrast or very little. In the hands of a skilled practitioner, that which is intentionally rendered would be optimum. When someone is in control of the photographic process and creates an image representing his or her vision then I’d say optimum exposure has been obtained. For someone less skilled, however, someone who is seeking to learn how to control exposure rather than be blown about by the winds of photographic ignorance, optimum exposure would simply be creating a photograph that is neither underexposed or overexposed. Again, how does one know when this has been achieved? This is where the histogram comes in. What’s a histogram? As stated above, it’s a graph that shows the distribution of brightness values within a photograph and it’s available on many if not most of today’s digital cameras . Using the histogram tool it’s relatively easy to tell if a photo is overexposed, underexposed or properly exposed. Interpreting a histogram is pretty easy once you understand how. Like any tool, the more one uses it the better he or she becomes, but the basic information a histogram provides is pretty straight forward. In order to understand the histogram one needs to know that digital photographs are made of little dots of color called pixels, usually millions of them. You may have heard the term megapixel. That means a million pixels. Most of today’s digital cameras produce many millions of pixels in each photograph. For example, a 12 megapixel camera creates photographs with 12 million pixels. Each pixel has both a color and a brightness value. Brightness values run from zero through 255 with zero being the darkest and 255 the brightest. Knowing this will help you understand how to interpret a histogram. More on that momentarily. When I instruct novice photographers in the subject of learning to control exposure I want them to fully understand the concepts of over exposure, under exposure and “proper” exposure. The histogram answers the question as to whether or not proper exposure has been achieved. Simply put, underexposed photos are too dark, over exposed photos are too light, and properly exposed photos are just right. In underexposed photographs everything is too dark and there may be areas that appear so dark they look completely black when they shouldn’t. This can result in subject matter that had visable detail in the real life scene losing that detail in the photo. Imagine a black sweater that has visible detail in real life: ribs or seams and texture in the material. Now imagine that sweater as a solid field of black with no ribs, seams or texture, just a solid black blob. That’s what would happen to it with enough under exposure. Photographers might say something like the shadows have been lost. Now imagine a white sweater with ribs or seams in the material. You’d see those ribs and seams in real life, but in a photo suffering from enough overexposure those ribs would disappear along with any sense of the texture of the material and the sweater would appear as a solid white mass. A commonly overexposed area in many photographs is white clouds that lose much of their detail. Photographers would say something like the highlights are washed out, blown out or clipped. Have you noticed that at times? A photograph that is properly exposed will in most cases retain much of the detail in both the shadows and highlights. Back to the histogram. It gives you an idea of the relative amounts of pixels at differing levels of brightness. Where the graph is higher there are more pixels at those brightness levels. Where the graph is lower there are fewer pixels at those brightness levels. Histograms are only available after a photograph is taken, not before, by the way. Here it would help for us to look at a histogram. 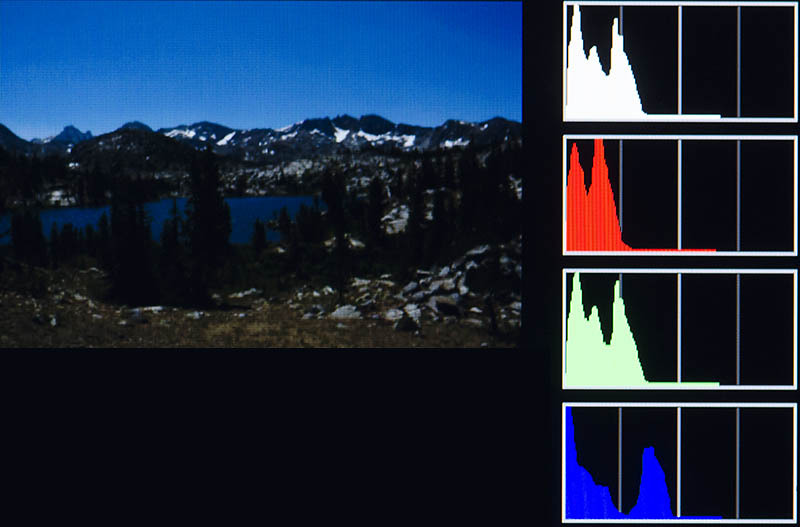 In the photo of the LCD display on my camera (immediately below) we see four histograms. For now, we’ll be looking at the white one at the top right. This white histogram is an average of the red, green and blue histograms below it. We’ll get to those shortly. So, what is this white histogram telling us? I photographed the LCD screen of one of my Nikons. (Extraneous text has been retouched out.) This image shows a “properly” exposed photo I was looking at on the LCD screen and alongside it one of the histogram displays available on my camera. 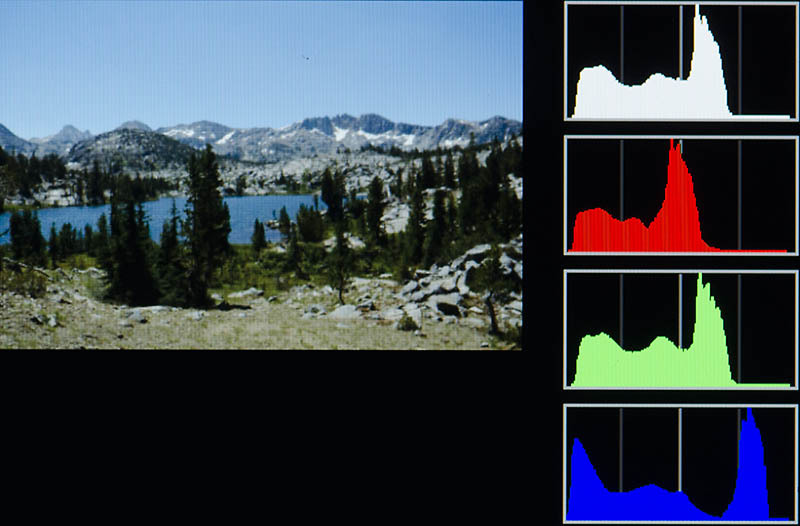 The white histogram at the top is an average of the three individual color channels (red, green and blue) used by digital cameras. See the article text for more. At the extreme left of the histogram along the horizontal axis is the brightness value of zero (it isn’t labeled). At the far right is the brightness value of 255 (also not labeled). This range of zero to 255 represents the 256 levels of brightness digital cameras are capable of rendering. There are no specific values associated with the vertical axis. All we know is that higher up along that axis represents more pixels and the bottom of that axis represents none. 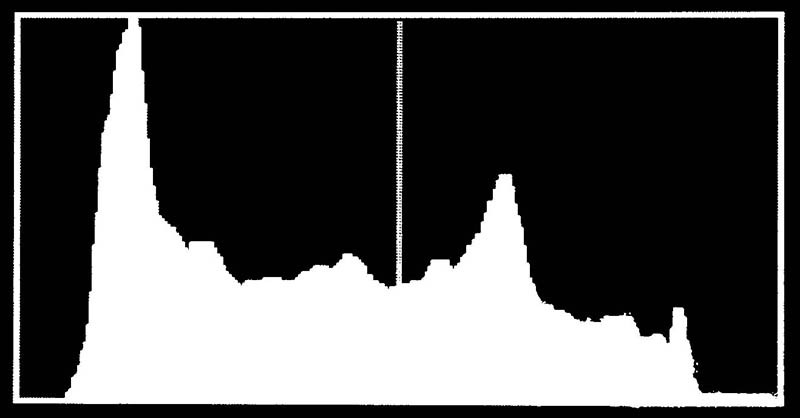 On my camera each histogram is divided into four sections from left to right. These sections are divided by vertical gray lines with the middle line bolder and brighter than the other two. You will see these better if you click on the image above in order to expand it to full size. These sections don’t mean much really. They are just a visual aid, but for the purposes of this explanation the vertical bar at the center of the histogram represents the middle of the brightness scale from zero at left to 255 at right, or brightness level 128. The important information is in the white area of the histogram, the graph. It shows the relative quantity of pixels along the range of brightness values. Look at the spike of white up to the top of the histogram just to the right of the vertical center line. That spike is telling us there are a lot of pixels in the photograph a little brighter than mid-tone 128 (mid way of 256 levels). Now look at the far left side of the graph at the bottom left corner. See that little bit of black space between the graph and the border? There are no super dark or black pixels in the photo. If there were a lot of really dark or black pixels in the photo then there would be a spike of white there too. 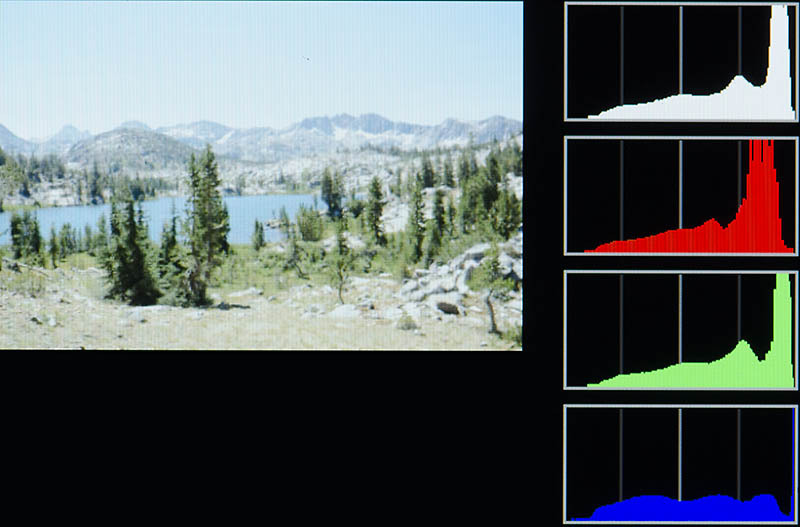 Again, the quantity of pixels at any given brightness level is represented by the height of the graph and the brightness of those pixels is measured along the horizontal axis. Most of the pixels in this photo are at brightness values above pure black and below brightness values of about 150 or so where that high spike is located. To the right of that spike the number of pixels falls off drastically. There aren’t many pixels brighter than those in the spike. The photo above was exposed normally. I let my camera’s light meter determine the exposure. Let’s look at another exposure of the same scene as above, but in this case overexposed by two f-stops. Consulting the histogram confirms overexposure, especially in the blue channel. Compare it to the histogram of the “properly” exposed image above. Much of the graph has been pushed off to the right, out of usable range. Those pixels are “lost”. They are ruined, too bright, unrecoverable. You can see how the graph has been pushed over to the right. Overexposing the photo made for more pixels of higher brightness values. That spike of pixels that was near the 150 brightness value is now up near brightness value 240 or so. Now, here is the same scene but underexposed by two f-stops. See how the graph has shifted to the left. Also, note that there are no pixels brighter than about 180 or so. Here the histograms have been pushed way to the left. Darker pixels in the image have been lost below brightness value zero. They are gone forever. Oh, the pixels are still present in the photo, but there is no detail in them. They are just black. They are below the threshold of useful. Summing up what I’ve written above: The histogram is a tool for evaluating exposure. It represents the distribution of brightness values in a photo. Pixels to the left of the left border due to underexposure will be black with no detail or off-color, gone, unrecoverable and lost forever. Pixels past the right border will be overexposed, white with no detail or off-color, gone, unrecoverable and lost forever. Ideally, you want all the pixels in a photo to be within the left and right borders of the graph. The only tool better than the histogram is your eye, but you can’t rely on your eye when, for example, you are out in bright daylight and can barely see the photo you’ve just taken on the LCD of your camera. Those LCDs aren’t known for accuracy anyway. In a controlled editing situation with optimum lighting and a calibrated monitor the histogram is an aid but your eye is the final judge. Out in the field where the situation is not controlled and your eye and camera’s LCD cannot be relied upon, the histogram is the guide to follow. Here we need to discuss the red, green and blue histograms briefly. The white histogram is an average of the other three. Such being the case it will lie to you at times. Before I explain that I need to mention that digital cameras record color images using three channels: red, green and blue. Every color in every one of your color digital photos is made up of some combination of red, green and blue. The red, green and blue histograms represent the corresponding channels. It is possible for one channel to have pixels that are too bright, overexposed, spilling out of the histogram on the right side were that possible. If the other two channels are darker, then the white, averaging histogram may not show you that one of the channels is too bright, that it is being “clipped”. The white, averaging histogram may look OK because it averages all three channels. The same is true on the dark end of the spectrum. This is why it’s always best to consult the individual channel histograms instead of the averaging histogram if your camera is capable of displaying them. Use histograms to check the exposure of your photos right after you take them. Try to keep all the pixels within the botders without allowing any to spill past the left or right edge. Adjust the exposure in order to do so. When photographing scenes with a lot of contrast, a high range brightness from dark to light, this may be difficult or impossible. HDR (high dynamic range photography) may help in those circumstances. If the brightness range of a scene isn’t extreme and all the pixels are well within the borders of the histogram, then, if you have editing capabilities so you can darken a photo later if needed, keeping the graph a little closer to the right side than the left will reduce noise in the photo. Noise is made up of improperly colored pixels found particularly in darker areas. So, there you have it, the mysteries of the digital histogram unraveled. If you make use of histograms to check the exposure of your photographs you will have more photos that are properly exposed and fewer photos that are too dark or too light.